By Tyler P. Berding, J.D., Ph.D. and Julia Hunting, J.D., P.E., S.E. and Anna P. Fabiano, J.D. For decades, litigation over the defective construction of multi-family projects has been a frequent component of a property manager's portfolio. Low-rise, wood frame condominiums, apartments, and townhouses have long been susceptible to construction mistakes which lead to disputes with contractors and developers. High-rise projects can also exhibit poor construction. Community associations and owners of apartment buildings have found many reasons to sue builders. 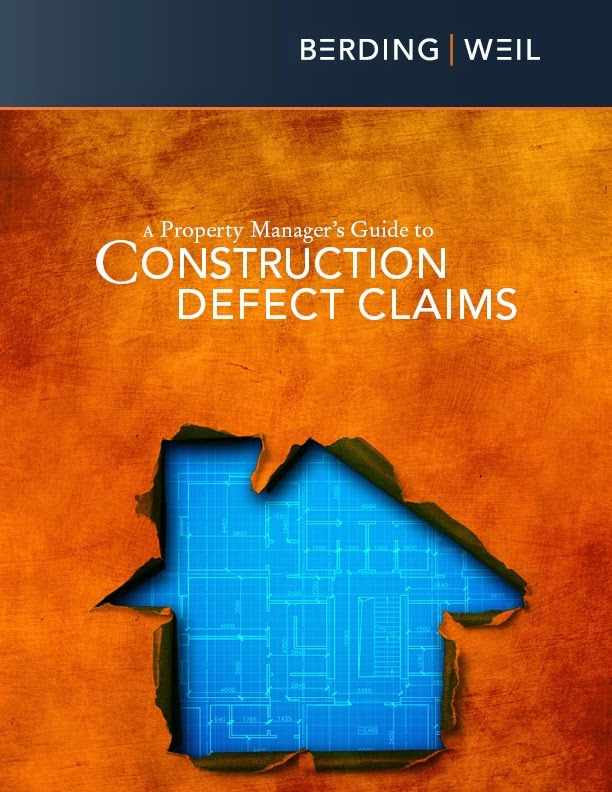 What leads to construction defects? Often it is a shortage of skilled labor in times of high real estate prices and demand. When there is strong sales potential, builders are eager to supply inventory, but good construction takes time and talent; when time and talent are in short supply, substitutions are made, which can lead to poor quality and subsequent claims. Construction defects may be noticed almost immediately by new buyers, or they may lurk within a building for years before the damage they cause is detected. These problems can be as obvious as an actively leaking roof, or they can be as subtle as cracking caused by soil problems that develop several years after purchase. They can be easy to fix or potentially catastrophic, and their severity will strongly influence whether or not the builder or contractor will make repairs without the compelling force of litigation. Here we cover construction defects in new construction. Defective repairs in new and older buildings are a topic covered in our companion book: “A Property Manager's Guide to Reconstruction Projects.”1 Property managers must have a basic understanding of the elements of a construction claim, so they can adequately advise their clients, retain or recommend appropriate professionals, and monitor the claims process. That information follows. We hope this resource will be useful to both you and your clients. 1 Tyler P. Berding. J.D., Ph.D., Paul W. Windust, J.D., and Julia Hunting, J.D., P.E., S.E., A Property Manager's Guide to Reconstruction (2013). I don't even think I want a condo anymore. Just one thing, always read and understand your contract before signing it. You may also discuss the contract and claims with an attorney as soon as possible after a dispute arises.